Not really. 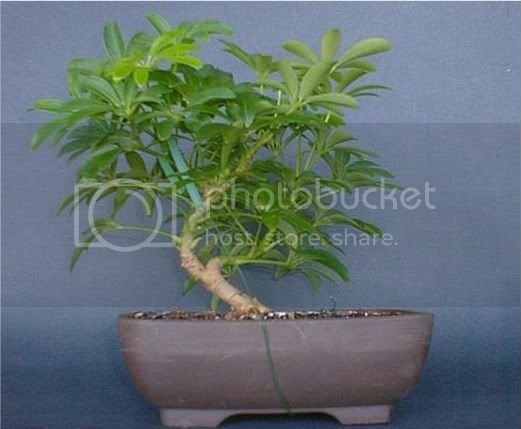 Most bonsai will take many years to develop, but with the Schefflera you can have a potential bonsai in less than a year. Here's one that I've been working with for the past six months. A six inch single stem cutting was taken on May 1st. 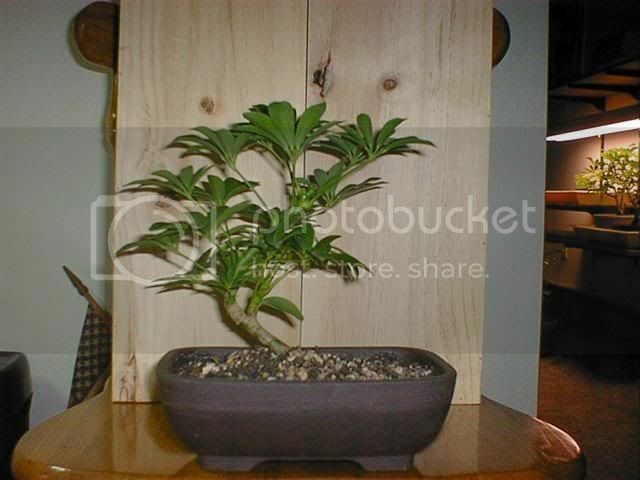 The cutting was rooted directly in an 8 inch unglazed pot using a 50/50 organic/ inorganic soil mix. Around the first of June the plant produced a new leaf at the apex. This is a good indication that the cutting has rooted. After 2 weeks of growth the plant was started on fertilizer. Dyna-Gro (7-9-5) full strengh was used. The tree was fertilized every other watering or about once a week. 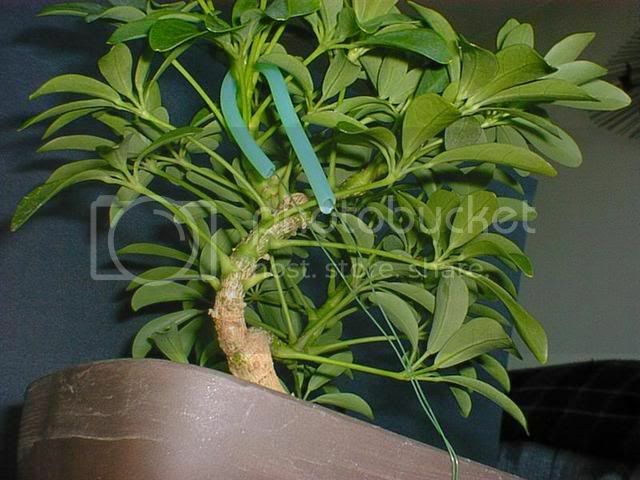 Around the 15th of July the plant had grown enough so that I could pull the trunk back over itself and tie it down. I used silicone tubing and florist wire for the tiedown. I was looking for something other than a straight or slanted trunk. After another month of growth the plant was at the height I wanted (about 8 inches). 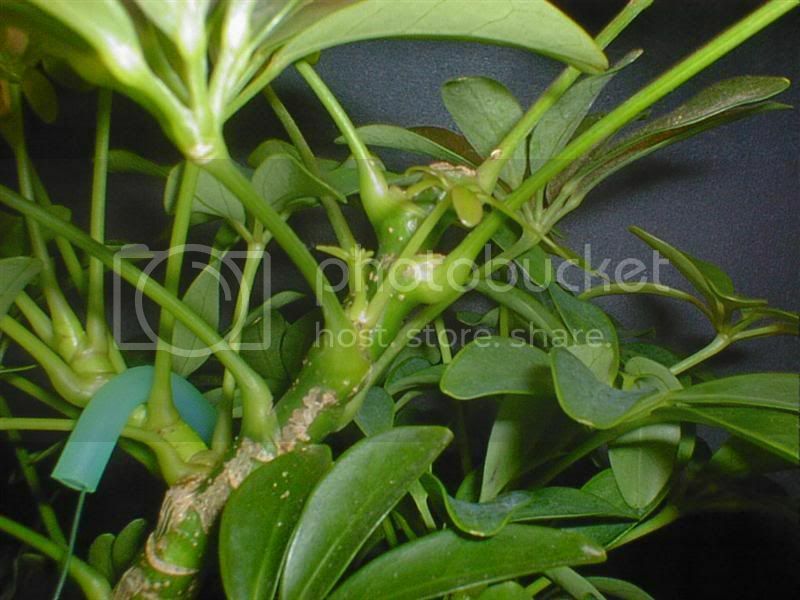 At this time I removed the growth bud at the apex and any new buds as they appeared. The first week in Sept. the plant threw me a curve and broke a bud low on the trunk.I didn't really want a branch at that position, but decided to leave it to deal with later. This was taken 10 Oct.. The tie down has been removed and the new branch is doing well. Same date. A leaf was cut just above the bend leaving the axil and Ã‚Â½ inch of stem. This will encourage a new bud in this area. 25 Oct. The new bud broke, but not where I wanted it. Oh well. As of this date it has been 6 months since the cutting was taken. The new bud is doing well. Another 3-4 months and the plant should start showing some potential. Updates on this tree will follow. Comments, questions and ideas are always welcome. Thanks for the pictures, I look forward to seeing how it progresses. 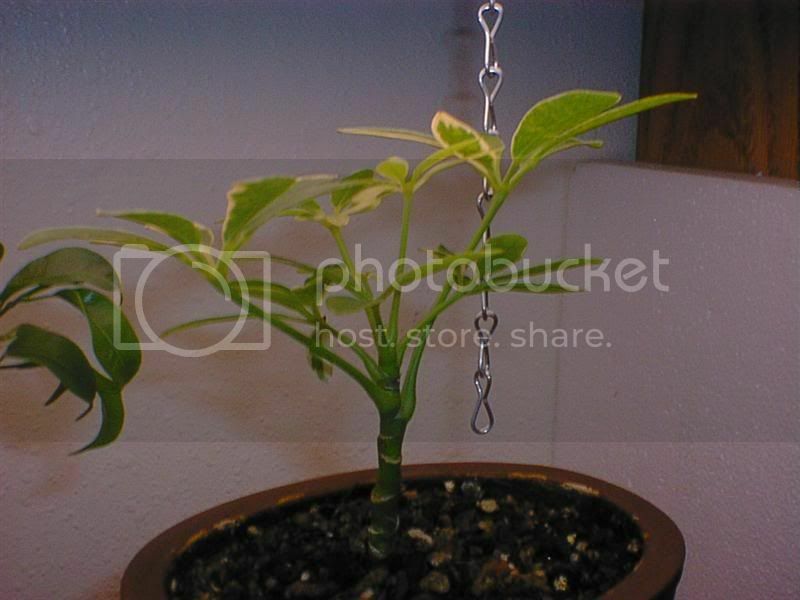 I'm surprised that your cutting was rooted well enough so soon that you could begin to train it with guy wires. As I mentioned earlier I have started with them earlier this year. Unfortunately I have not had as much success as you. 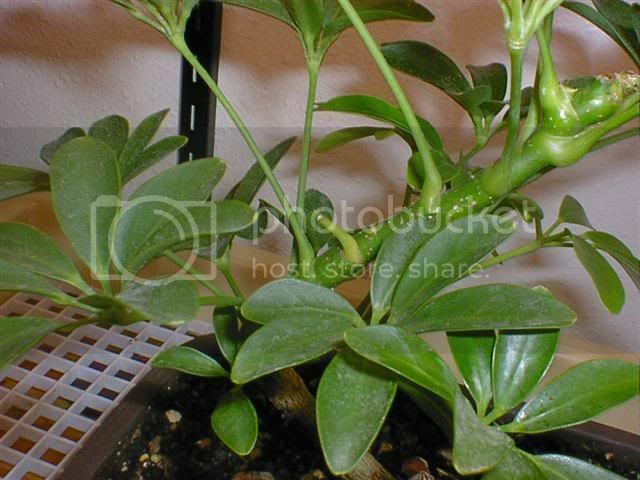 In looking at Jerry's site I see that the full sized version is actually a different species, Brassaia actinophylla. Somehow I have overlooked this until recently. 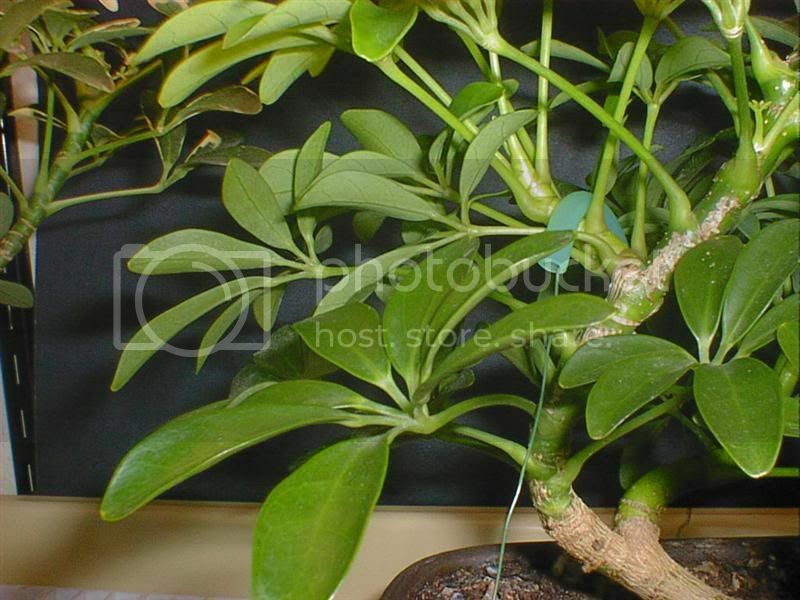 The dwarf variety is the actual Schefflera arboricola. Which variety are you growing? The leaves look considerably larger than the one I have. Do you know if there is a difference in vigor between the two species? 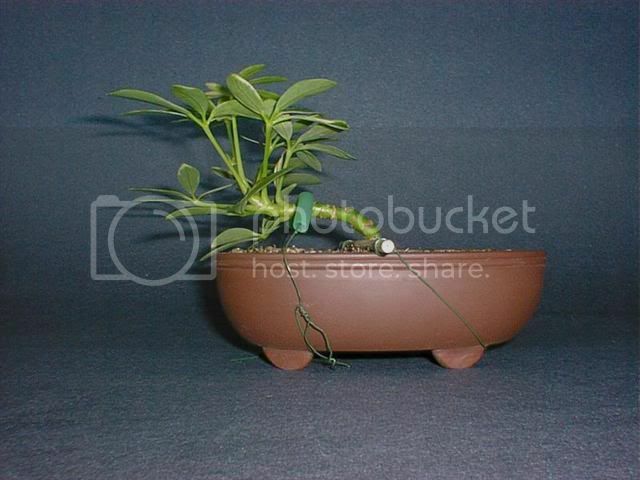 Several months ago I purchased a small pot with three individuals. When I separated them I found that they were not even really rooted. Two did not survive and the one that did is not exactly setting the world on fire, though I think it is 'out of the woods'. I have been a little lax in my fertilization schedule, so I suppose that may have something to do with it. I grow two varieties of S. Arboricola. 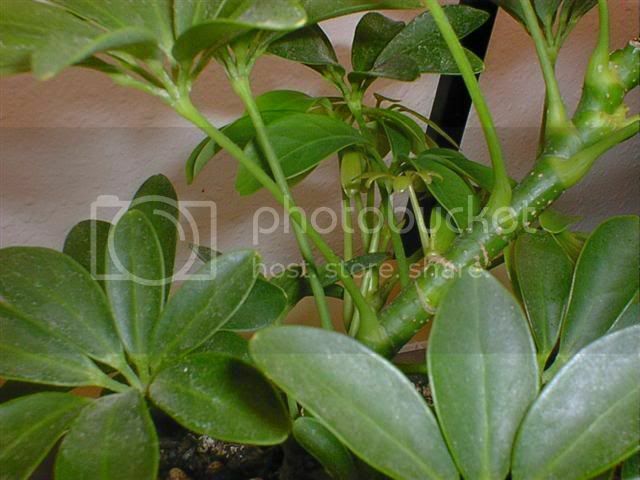 The one in the photos is the standard green variety. 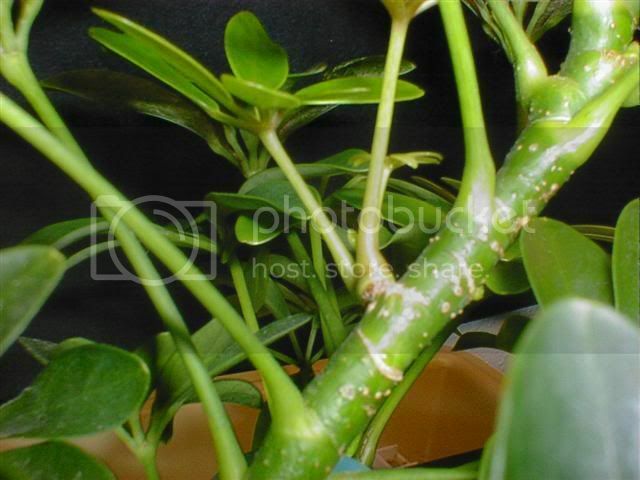 It's leaves are no more than two inches long. In the closeups they do look huge.The varigated variety I have has smaller leaves. I don't grow B. Actinophylla so can't tell you much about them. 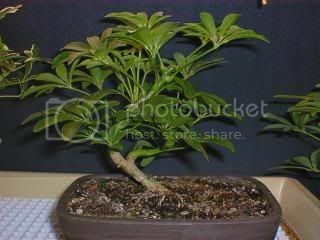 I know they have much larger leaves and require a wet / dry watering schedule. Jerry would be the one to ask. I believe he grows both species. The lower branch was pulled down and tied off. This opened the plant up a little to allow more light to the upper branch. It should start taking an upward swing in the next two weeks.Some soil was pulled back from the base of the trunk to see what the roots were doing. Nothing great, but they are harding up as is the main trunk. The new branch at mid trunk is doing well. Three leaves and another on the way. It will be allowed to grow vertical for now. I was thinking of putting a branch on the outside of the bend in the trunk. Not sure if this would be a good fit. At any rate I'll have to wait til the other branches grow a bit. Any ideas on this are welcome. Tiedown has been removed and lower branch is set. Mid trunk branch is growing well, but not long enough to do anything with yet. Plan is to pull the branch down and to the left. This will help balance the plant. Still undecided on putting a branch at the bend in the trunk. Heres a shot of the rootage. The white you see is mycorrhizal fungi. I mix the spores with the soil before starting a cutting. The fungi helps the roots take up water and nutrients and acts as a extention of the root system. 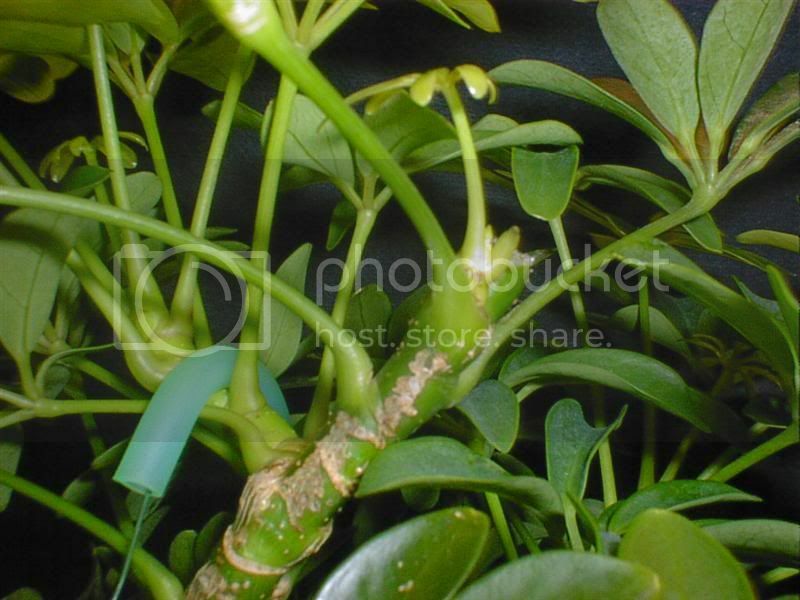 This allows the plant to put more energy into top growth instead of the root system. This is a small verigated cutting I started a couple of weeks ago. It's about 2 inches tall without the leaves. 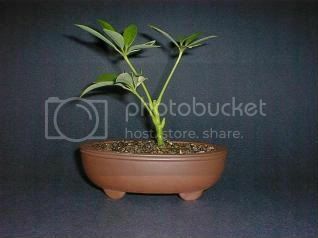 A 5 inch unglazed pot was used with a 50/50 soil mix. We'll see how this one works out.. Thanks for the update. You really seem to have the knack for growing these. Do you inoculate all of your scheffs? 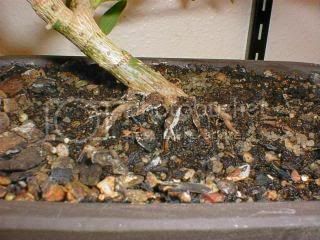 I don't think I ever heard of anyone using mycorrhiza on tropicals before. Do you use a specific variety/species? This is one subject I have never really experimented with. This is the first time I've used Myco with Scheffs. I've used it with container grown tomato and hot peppers for a number of years so thought I would give it a try with this Scheff cutting. Tomatoes and peppers are tropicals so why not give it a shot. I use the shotgun method since Myco can be plant specific. The product I use contains 13 species of Myco and it seems the Scheff has developed a relationship with one of them. I don't recommend it's use since an association with the "wrong" fungus may decease the vigor of the plant. Conifers will benefit from it. In fact some conifers will not do well unless this symbiotic relationship is established. Not a whole lot to update.. The mid branch was pulled down and to the left..
After weeks of nipping new growth a bud broke below the apex in the right place.. 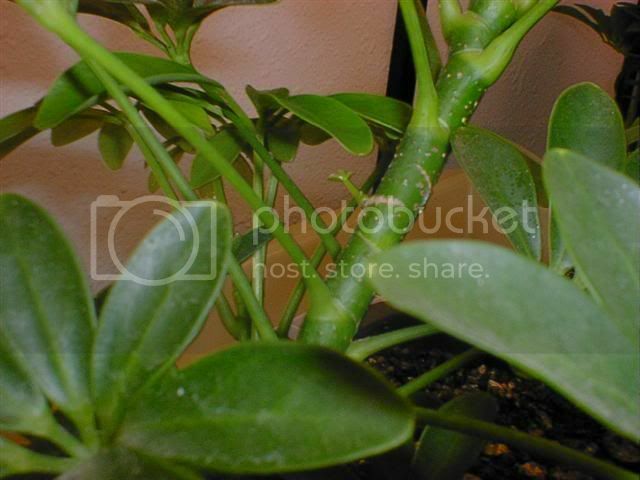 The apex was cut back to the bud leaving the scar to the back of the plant. The fertilizer was changed to Dyna-Gro 3-12-6. Less nitrogen, more phosphorus. This should give the roots a little boost over the next couple of months. As it looks today. The mid branch will have to be pulled down a little more to get it where it should be.. Here's the little guy. Time to start training.. The mid branch was pulled down and forward again. Another month will tell if it's in the right place. A couple of lower leaves were removed. Here's the little guy in training. 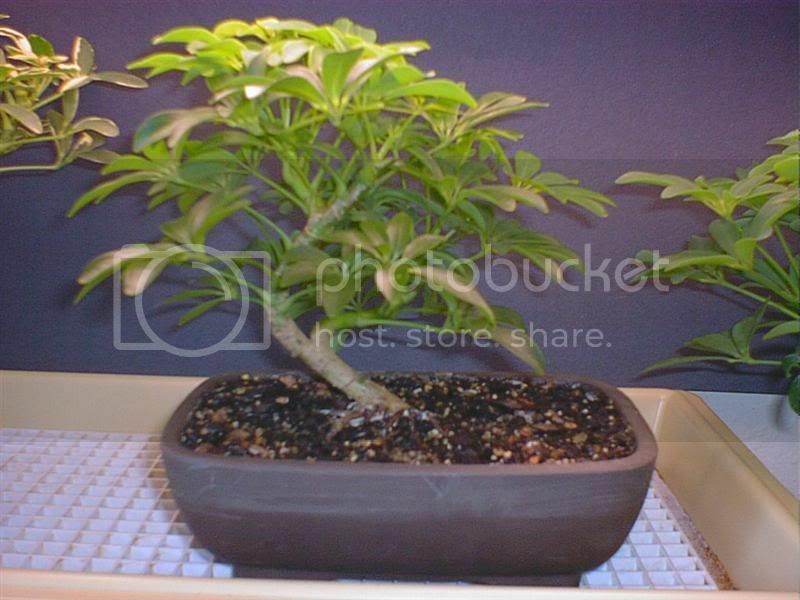 The plan is to let the plant grow 4-5 inches upright then remove the lower leaves and plant it in a deep pot over a rock. I'm a little unsure of your intentions here. Are you going to grow it horizontally on the rock? That is what I had in mind, if I can get it to work. Thank you for your comments and question. This is the tie down or pull down method. You will need florist wire or picture hanging wire, silicone air line (get at the pet shop), and bamboo skewers(many uses for these). Thread a piece of tubing over the wire. 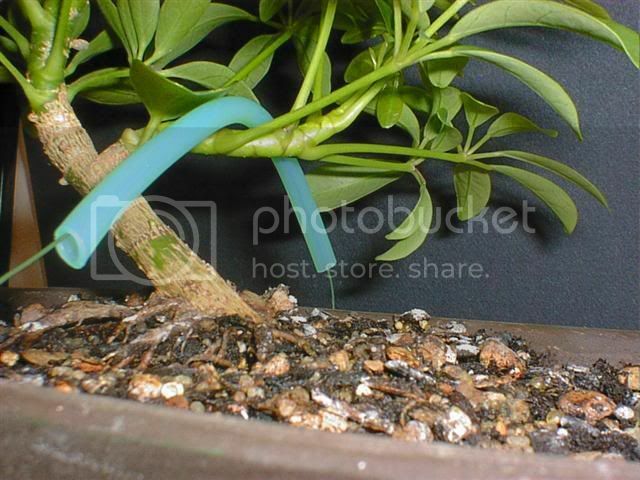 Wrap the tubing around the branch or stem, bend and tie down. 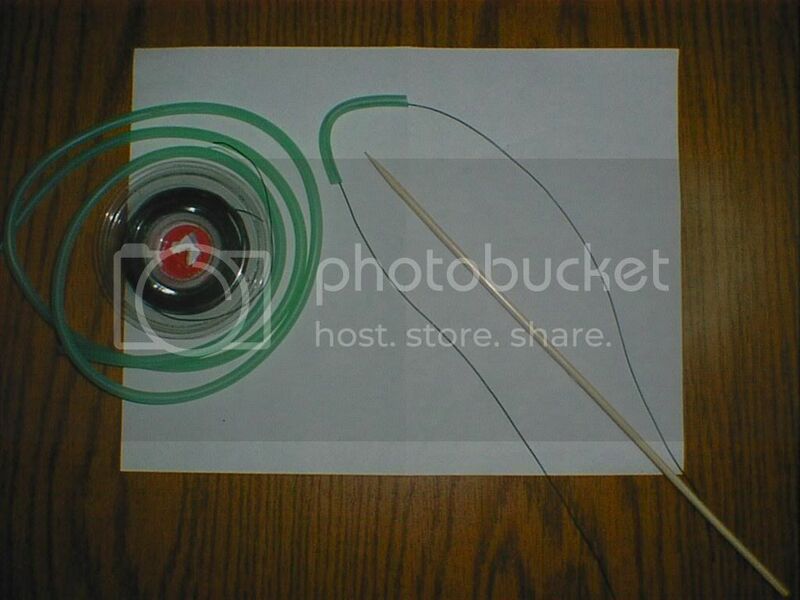 Thw silicone tubing prevents scaring from the wire and allows the plant to grow freely. With the little guy, a bamboo skewer was wired tight against the upright stem, then the stem was bent into position and tied down. 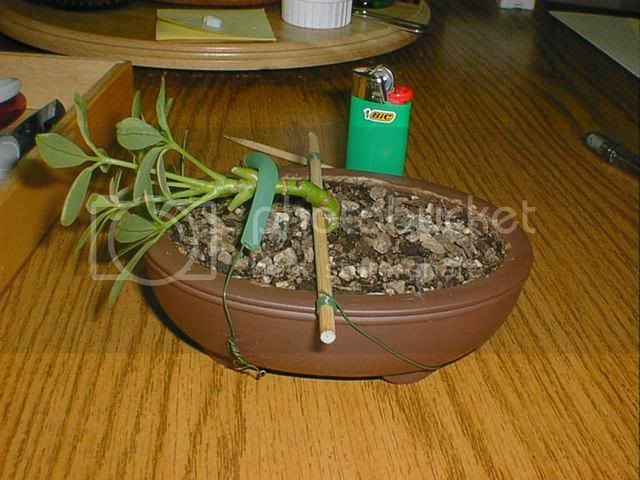 This method works well with young plants, but be careful with older wood and don't bend too much at once. This thread of yours is very helpful for me. Matter of fact, (and as I just mentioned in my intro. thread) it was my inspiration for joining the forum! 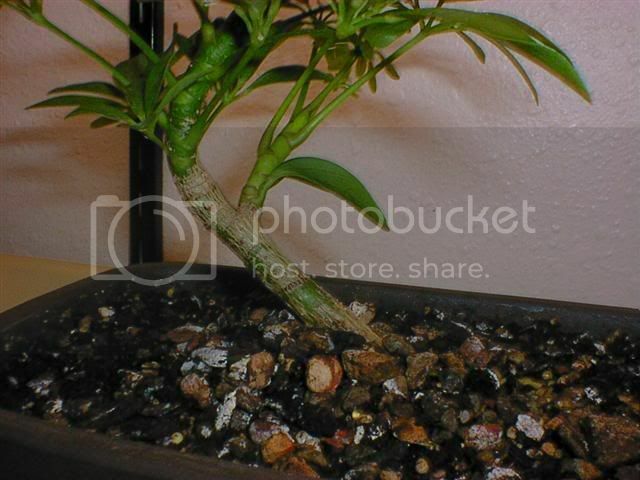 The photos and descriptions (of both the plants and the training materials you've used) have been very informative---exactly what I've been searching for as I begin my journey into arboricola bonsai. I'd love to see some updates.